"Go away, Michael. You’re too small!" shouted Kevin, his older brother. 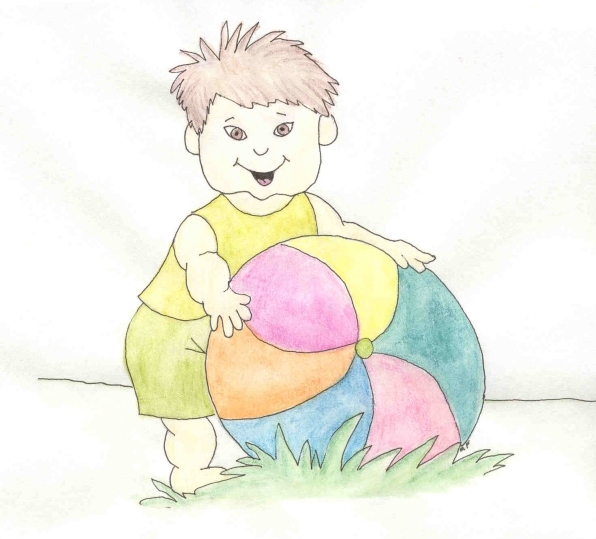 The bright colored ball flew through the air as Kevin, and his friend Douglas, tossed it back and forth. Michael ran after it every time one of the boys dropped it. "Michael, put the ball down and go away. Why don’t you play with your bucket and shovel and make a sandcastle." Kevin pulled the beach ball out of Michael’s arms. Michael fell to the ground and started to cry. His mum picked him up and carried him down to the beach. "Let’s build a big sandcastle," she smiled and filled the bucket up with golden sand. Michael had fun with his mum, but kept looking over at Kevin and Douglas and the beach ball. After lunch, Dad, Kevin, and Douglas went swimming. Michael watched the waves slosh over the top of them. Just then he spotted the beach ball. It was sitting in the grass. He toddled over to it and picked it up. It was almost as big as he was. It was red, green, yellow, blue, orange, purple and yellow. He rolled around on it, giggling with delight. It was soft and squishy and a lot of fun to play with. Finally Michael was happy. He was able to have a turn with the ball!